Padlocks are the perfect accessory for any trade counter, key cutting shop or hardware store. That’s why we created the CitySafe Padlock Bundle! 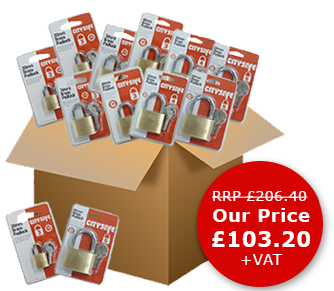 This fantastic bundle includes a mixture of 48 CitySafe branded padlocks – so there’s something to suit every customer. This bundle has the recommended retail price of £206.40. But here at CitySafe we believe in low prices without compromising on quality – that’s why our price is only £103.20+VAT! 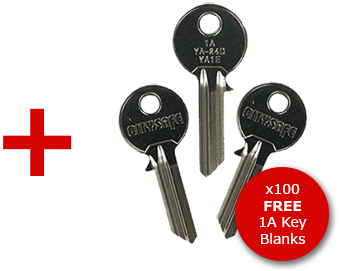 Remember the CitySafe Padlock Bundle – complete with x100 FREE 1A Key Blanks is only available while stocks last! This bundle is always a popular one so don’t miss out! Previous Previous post: Introducing the CitySafe Key Cutting Machines – Low Prices without Compromising Quality! Next Next post: Fullex Centre Case Gearboxes available at CitySafe!